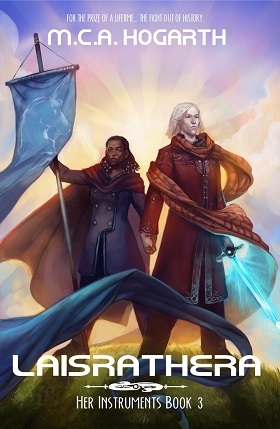 Reese Eddings [see the cover by Julie Dillon] is the human captain of the TMS Earthrise, a ‘rattletrap merchant vessel’ that has been barely breaking even in United Alliance space. Six years ago, Reese was facing bankruptcy and the loss of her ship when a Mysterious Benefactor offered to cover her debts in return for a favor someday in the future. Reese has not been any more successful since then, and she has been dreading the return of that benefactor. When the latter does return, though, she does not want the money repaid, but for Reese and the Earthrise to rescue an “investigator” imprisoned on a non-Alliance planet, before he can be sold into slavery. The agent is an Eldritch. 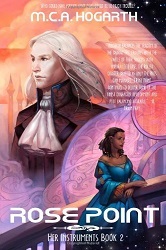 When Maggie Hogarth published Earthrise, she sent a note that it might not be appropriate for review in Flayrah because it wasn’t furry enough. Reese Eddings was a Martian human, and the Eldritch look like tall, albino humans. Yes, but the crew of Reese’s “rattletrap merchant vessel” were mostly very furry Pelted races, and there were plenty of Pelted background characters throughout her 25th-century galactic setting. There was no problem as far as appropriateness to Flayrah was concerned. "After that… who knows? I guess we’ll go wherever sounds most interesting." Rose Point consists of three adventures of about ninety pages each. During the first, the telepathic Hirianthial begins to exhibit new mind powers beyond those of the other Eldritch. While this helps Reese and her crew to escape from that adventure, Hirianthial fears that his new powers may unintentionally endanger them. He desperately needs training and help that only are available on his home world. Reese finally gets permission from Queen Liolesa to bring him there. 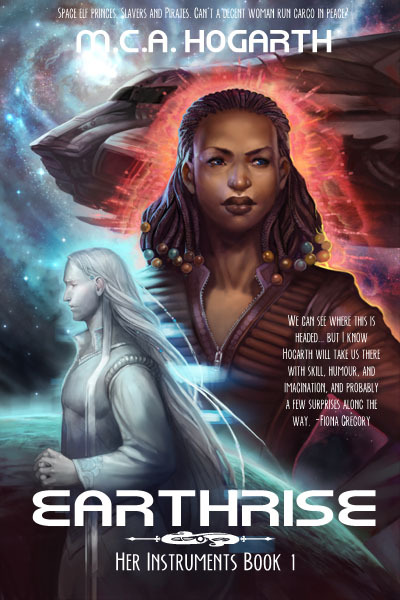 The Earthrise will be almost the first non-Eldritch to see their world; a never-expected, “once in a lifetime” opportunity for Reese and her crew. Laisrathera brings them to the legendarily beautiful Eldritch homeworld just in time for a full-scale war. The planet has been betrayed to the Eldritch’s enemies, and Liolesa and her court have been forced to flee offworld by the invaders and their native quisling figurehead. The enemy include the space pirates that the Earthrise have been running into ever since Reese and her crew rescued Hirianthial in the first novel of the trilogy, plus dragons! Most of the Earthrise’s crew are already on the Eldritch world to help the loyal underground there. Yep, it’s a star-crossed romantic space opera, featuring a poor human from Mars and an incredibly handsome, rich, and powerful all-but-human Space Elf. But the others! All three books of Her Instruments are full of the variety of Hogarth’s bioengineered Pelted peoples. There are enough tails, furs of various thicknesses and patterns, mobile pointed ears and different physiques to satisfy all furry fans, even if the main characters are (or look) human. Of course, it helps to like both space-opera science fiction, and women’s romances. Remember, this is a trilogy; or more accurately, a single novel in three volumes, like Tolkien’s The Lord of the Rings. You have to read all three, and in the proper order. Earthrise, then Rose Point, and finally Laisrathera.